Dogs are “denning” animals and many breeds like to burrow. 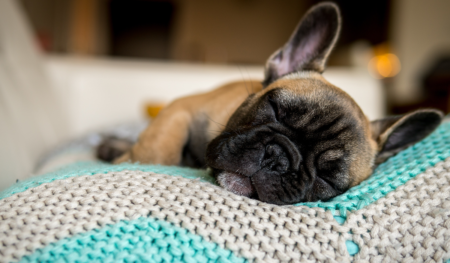 To help fulfill that canine instinct, get a blanket that specifically belongs to your dog and keep it at their bed (or on the couch for the extra spoiled dog!) There are even burrowing beds available for purchase that already have a blanket made into the bed. Some dogs like to tug and pull when you take them for a walk. If yours does that, having a collar around their neck can be straining – especially if you’re trying to keep them away from that squirrel! A harness is a safer alternative because it’s escape proof, offers more control, and you won’t feel like you are choking your dog every time they tug. A lot of dogs suffer from separation anxiety, are fearful when they travel, or tremble when it storms. An anxiety jacket offers comfort for your pet. The pressure from the jacket holding them helps to calm the dog during those times when they are usually nervous. You are their comfort but, when you can’t be around, this jacket can help. Proper hygiene and care for a pet are not only essential to their health, but also their comfort. Long nails make walking uncomfortable and painful when they scratch. Dirty ears are itchy. Long hair blocks vision. The list can go on! The more you groom, the more the dog gets used to it as a routine and this brings comfort all around! Our pets provide us with love and support, so should we do the same for them? Some occasional (or frequent…) spoiling is good for your dog to show them how much you care for and appreciate them! So go ahead – spoil your pet. We won’t judge.